Grand Island Central Catholic proudly sells a large variety of clothing and other items that you can purchase! At various times throughout the school year, other groups at GICC may have items to purchase. Please support our Crusaders by proudly displaying GICC when you can. If you're interested in different activities, we have several options to choose from. We have something for everyone! Please direct questions regarding clothing orders to Julie at T-Shirt Engineers. Direct other questions to the school front office at (308) 384.2440. 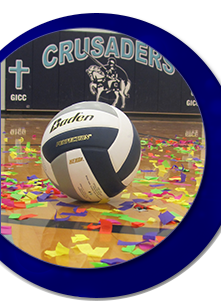 Get your gear to support the GICC Crusaders at all of their games and events! Students can also wear most of these items on Crusader Spirit Wear Fridays. Items must be ordered by the deadline posted on each order form. New items will be released throughout the school year too, so check back often for additional upcoming order forms. Coming Soon: Spring Sports Crusader Gear! Check out the GICC Fine Arts Guild items at the below links. They will be out for sale at various events and games. Email Jackie Cornelius for questions and purchasing or call her at (308) 390-9172. New this year, the J-Crew wants your photos too! You can help the staff collect important moments by uploading your best pictures using our yearbook photo submission link (access code: GICCJournalism). The 2018–19 Crusader yearbook, Splash of Class, is now available for purchase for $45 (HS) or $25 (MS). Be sure to order your high school yearbook and/or middle school yearbook today! To upload your senior pictures for the yearbook, use the button below on the left. Please view the form below to order your button pictures, team photos, and fat head paddles.